Costa Farms Social Summit held in Miami earlier this month was a huge hit. Everyone was blown away by seeing hundreds of thousands of orchids, ferns, succulents, cacti and other tropical plants in one location. 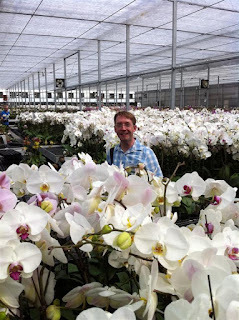 Justin Hancock, BHG.com editor, pictured here in orchid heaven, had this to say: "Last week I had the pleasure of traveling to Costa Farms, one of the coolest companies in the horticultural industry." Justin says the the Costa Farms trial gardens, which are open to the public, are "definitely worth checking out if you’re in the area. " Martha Stewart Living senior associate garden editor Stacey Hirvela (pictured here with me) wrote two blog posts. In her first post "Meet Maria Costa Smith, Stacey told us about Costa Farms' sustainable initiatives. "Maria told us about some of the things that they are doing to be a smarter, better source for plants. While they are working on addressing all of the sustainability issues I mentioned, it is the packaging that gardeners will notice most." Click here to read more and take Stacey's packaging survey. In the second post, entitled "Sublime Reputation", Stacey talks more about the plants. "When I was down in Miami visiting Costa Farms, one of the most stunning sights was the sheer quantity and precision of their growing ranges. It's pretty unbelievable to be standing in a room with nearly three quarters of a million orchids, or 60 acres of nothing but Boston ferns." 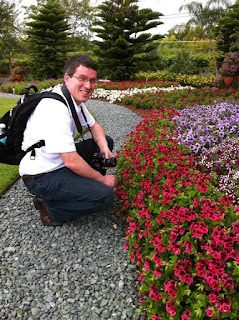 Stacey posted lots of great pictures to give you an idea of the scope of the Florida nursery. Christopher Tidrick actually won a social media contest to attend, and we're glad he did. What a delight he is. He did a great post Plants with a Purpose, A Plantsman with Passion , calling the trip to the Costa Farms greenhouses "a visual experience so surreal, there aren't really words that can do it justice." But he found the words and really recapped everything -- from Costa Farms O2 for You educational program, to the Wall Street Journal's recent article to a wonderful profile of Mike Rimland. 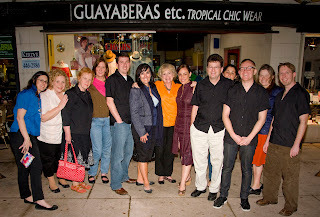 Here we all are in our guayaberas, or Cuban wedding shirts for our closing dinner. What fun to be Cuban for a night! The Social Summit was amazing! It was an honor meeting net-workers from various walks of life touring the Costa Farms establishment just outside of Miami Florida early this month. Great to see some of the greats featured on your blog. Now when I see a houseplant waiting to be purchased at the local garden center I see it in a totally different light!